Swagbucks has been my favorite way to earn extra money online, and now they're also helping us commemorate the armed forces. 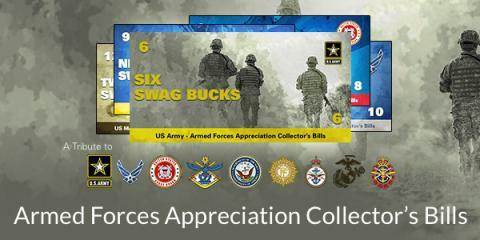 Swagbucks just released the Armed Forces Appreciation Collector's Bills, just in time for the Memorial Day weekend. They're live now until Sunday, June 1st at 11:59pm PT, so you have until then to collect all 5 Bills. Each Collector's Bill celebrates a different branch of the armed forces, and if you collect all 5, you'll automatically receive a 15 SB bonus! So how do you collect them? It's easy, just use Swagbucks Search as your normal search engine, and you'll randomly win different Collector's Bills - plus Swag Bucks each time you get a Bill! Why not get a little extra towards a free gift card for just searching online? If you haven't gotten free gift cards from Swagbucks yet, sign up here to get started and collect all the Armed forces Appreciation Collector's Bills!